When we grow marijuana indoors, there are several factors to keep in mind if we don’t want to get in trouble. Together with the lighting system used, the ventilation of the growing space is crucial if we want to have healthy plants and get best yields. Poorly ventilated environments don’t allow proper plant respiration; marijuana needs CO2 during the day and O2 at night, and if we do not ventilate correctly our grow room our plants won’t have enough amounts of CO2 and O2 to develop properly. Here you have further information on CO2. This is why, normally, air extraction fans are used in all indoor grow rooms, to which growers connect carbon filters to remove the odour from the plants while also removing heat and humidity. 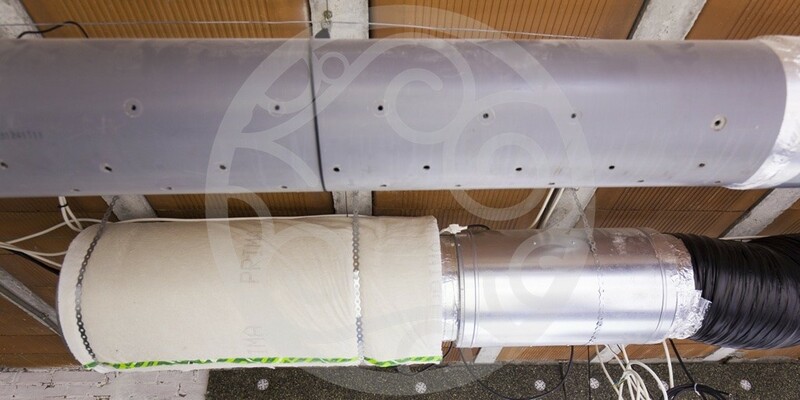 For improved performance, growers also use intractor fans (always of lesser airflow capacity than the extractor fans, so negative pressure is created and odours don’t escape the growing space through holes or zippers) which are constantly supplying the grow room with fresh air from the outside. 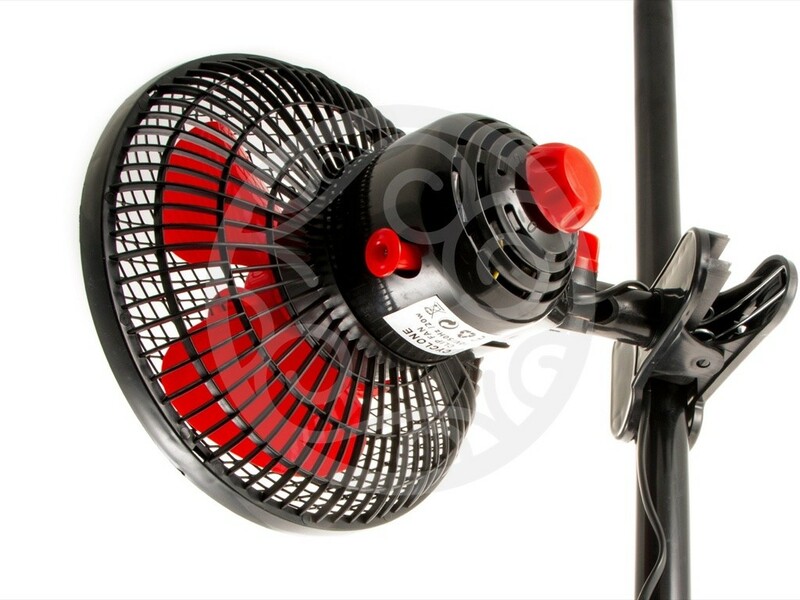 Finally, using fans inside the growing space is also recommendable, since they produce a constant airflow that helps avoiding heat/air pockets. As we can see, this setup not only allows us to have fresh air in our grow room but also eliminates all odours coming from it, plus decreasing temperatures and humidity levels to optimal values. To get the most out of our ventilation system, and since most times what we need is to decrease the temperature inside our grow room, we should put our extractor fan in the upper part of the growing space. 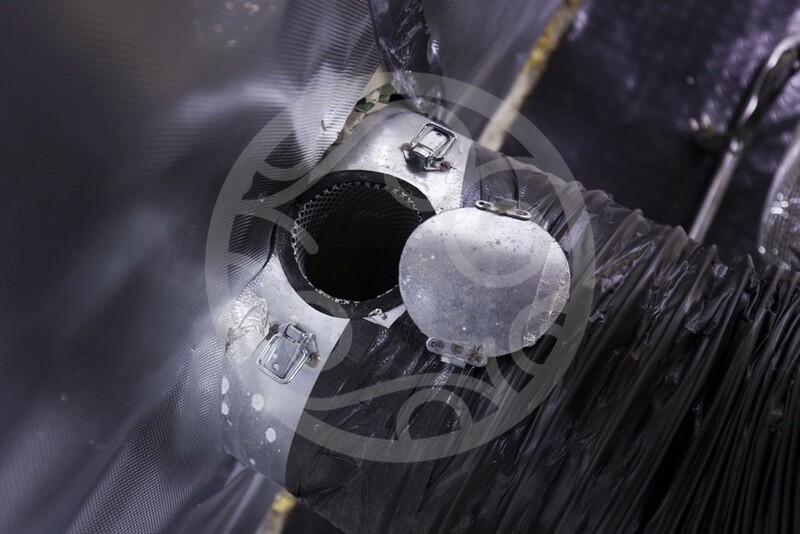 As we know, the warm air rises, so if we want to remove it placing the extractor fan in the upper area is the most logical, right above the reflectors or connected to them in case we are using air cooled reflectors. 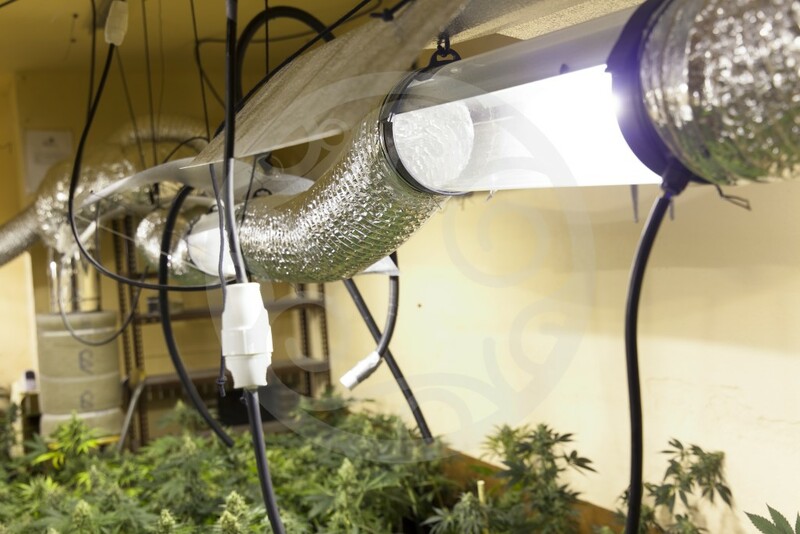 Under this scheme, the intractor fan – which gets fresh air from the outside and directs it inside the growing space – should be placed in the lower part of the grow room. In the rare case of needing to raise the temperature of the room, even with the lights on, we should do the contrary, placing the extractor fan in the lower part of the room and the intractor fan hanging above the reflectors (which of course won’t be air cooled). A commonly used formula to know the necessary airflow capacity (m3/h) of our extractor fan is top calculate the total volume of our grow room (m3) and remember that our extractor should renovate all the air of our room in less than 5 minutes. 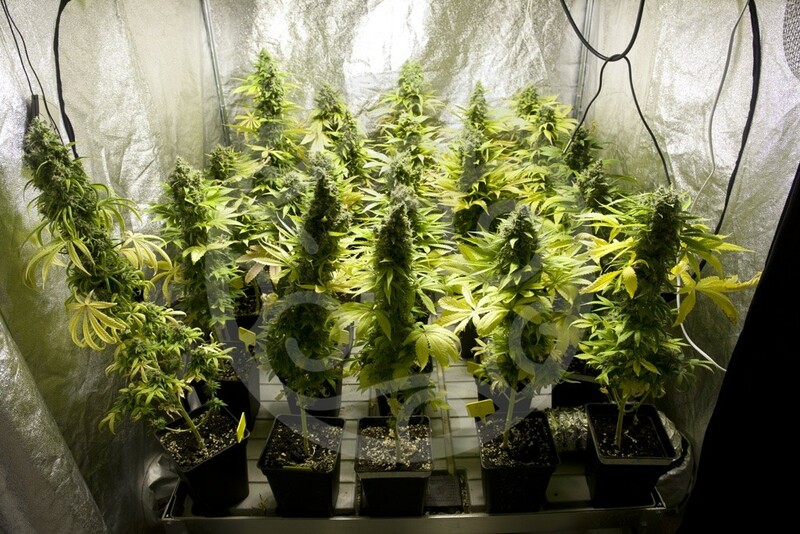 Of course, and in regard with temperature, it is not the same using CFL’s or LED panels than HPS lamps. The temperature of our grow room also depends on both the airlfow capacity of our intractor fan and the place where the air comes from: it is quite different having the air intake inside the house than in a shady and fresh corner of our backyard. Thus, before purchasing our extractor fan, we must take into account both the total volume of our grow room and the lighting system used. Many growers turn their ventilation system on when the lights are on and at time intervals when lights are off (check the temperatures and humidity levels of your grow room and use a timer to set the desired intervals). 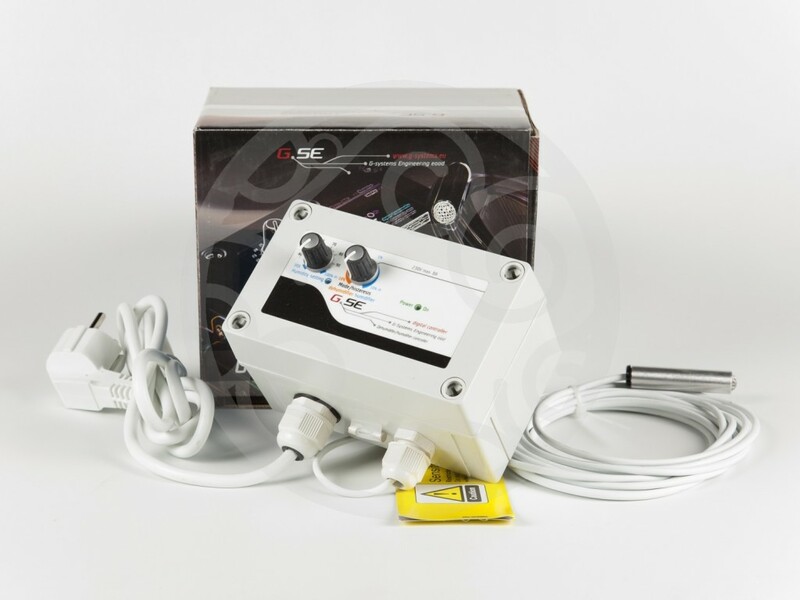 If we want to be more accurate, there are several climate control units on the market that will help us to have the perfect environment for our plants. 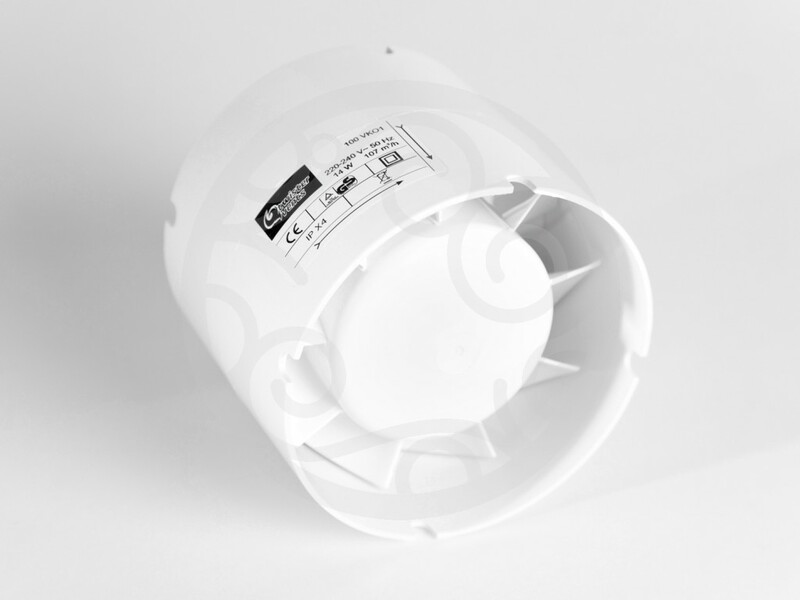 We just have to connect our extractor/intractor fans to these units and set the desired temperature/humidity range. 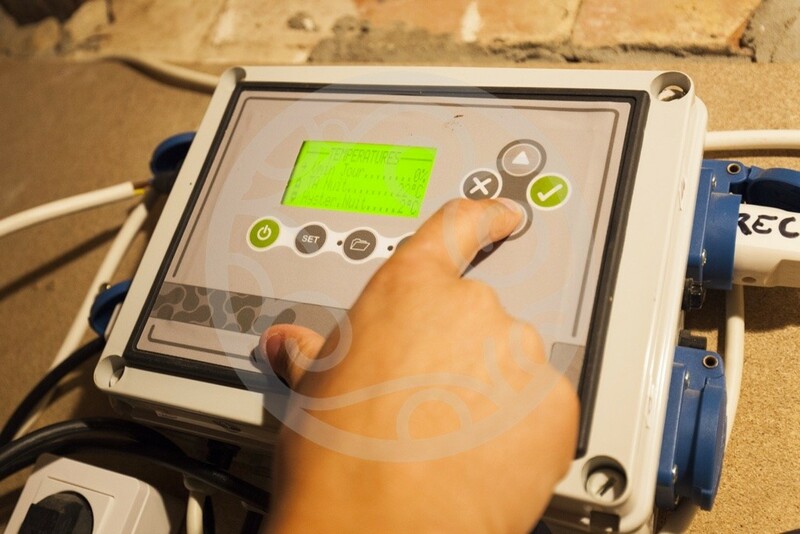 The unit will control our ventilation system by turning the connected devices on/off when necessary. 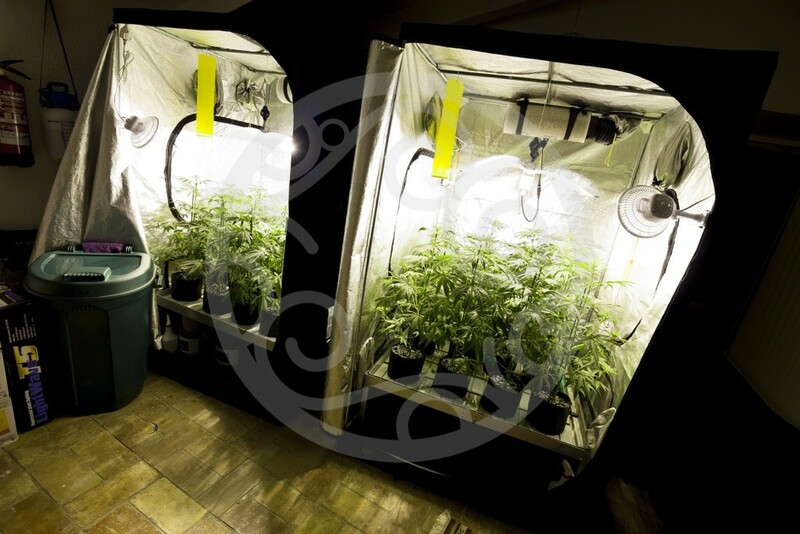 Our grow room should be at 26-28ºC with the lights on and at 20ºC with the lights off. We must not forget the importance of humidity when growing cannabis indoors. When we have a small space full of plants, humidity levels rise notably, especially when plants are flowering. Our ventilation system renews the air of our grow room, keeping humidity levels at optimal values. 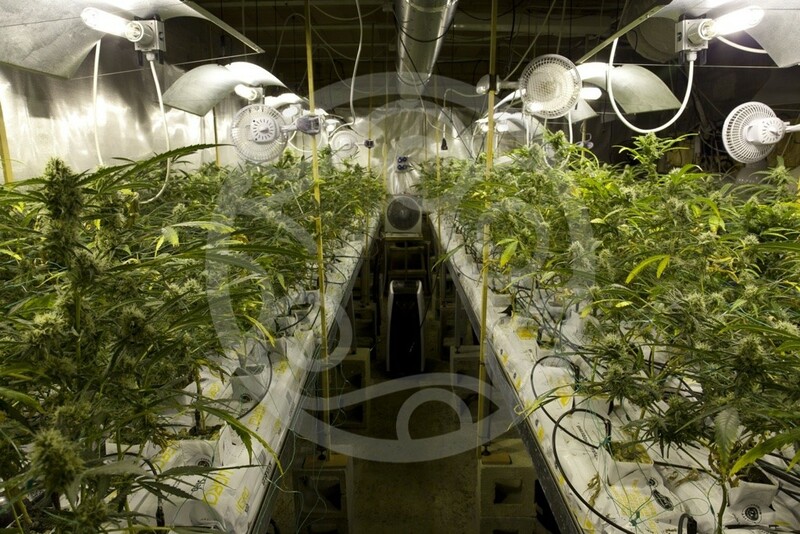 During the growth stage , the humidity level should be around 70%, 50% during bloom to avoid mold issues. If necessary, growers also use humidifiers/dehumidifiers to raise or lower these values and provide their favourite cannabis varieties with the perfect environment. As we already mentioned, our ventilation system allows us to renew the air of our grow room while eliminating odours from the plants. 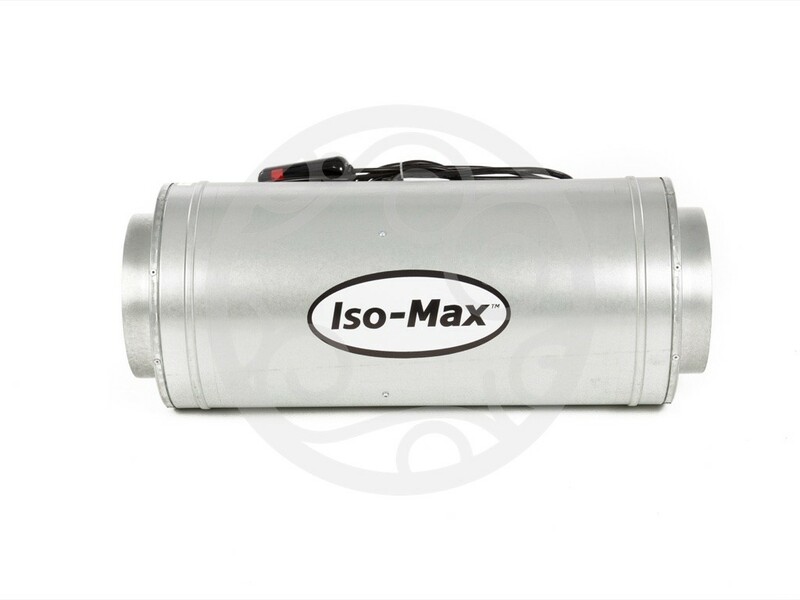 Besides renewing the air, our extractor fan is also perfect to connect an active carbon filter or a tubular ozonizer to remove the intense smell of our marijuana plants. 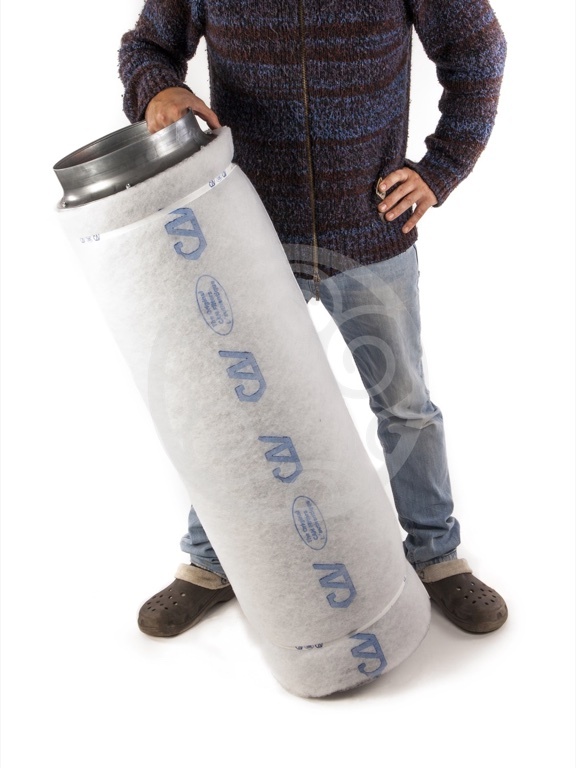 In this way, all the air removed from our grow room goes through the filter/ozonizer, which eliminate the odorous particles from the air before it is extracted outside. This is particularly useful when growing smelly strains such as Cheesy Auto or Naranchup. If we want to upgrade our system, we can use CO2 in our grow room, since plants are capable of assimilating much more CO2 than that found in the air, developing faster and stronger. Still, we need to take into account a number of aspects regarding cannabis cultivation before attempting to use CO2 generators. Remember that cimate control is a key factor to get the best possible quality from your crops. It doesn’t matter what genetics we are growing or what nutrients we have: if the environment is not suitable, plants will never show their full potential. Best quality and top yields can also be achieved under perfect climate conditions! Today, you can find on the market everything you need for a perfect ventilation system: extractors/intractors with different airflow capacities, pedestal fans, clip fans, silencers that reduce the noise and vibration of the air flow, air conditioners, heating maps and wires, etc.